Lunch time is often about using up leftovers in our house. With 5 little ones, we have to be as frugal as we can. At times this can be a challenge, but I have become pretty good at turning random leftovers into something the kids will enjoy. 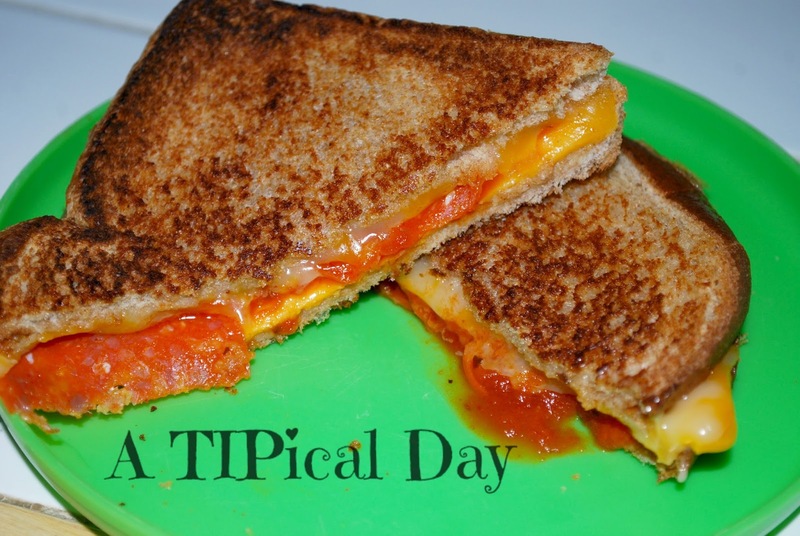 One such recipe was this Pizza Grilled Cheese. My kids love it and ask for it often. To make this recipe you will need your favorite bread, cheese (I like colby jack or cheddar), pepperoni, and about 1 teaspoon of either pasta or pizza sauce. You can actually make this one of two ways. 1) Assemble the sandwich without the sauce and grill. Use the sauce and for dipping. 2) Assemble the sandwich including the sauce and grill. My kids prefer the second method as it most resembles pizza. What's your favorite grilled cheese recipe? Do you have any good ones? This sounds so easy to make. I love it that you use cheddar cheese in your recipe. It's one of my favorite cheese. Mine too Judy. This is super easy and my kids love it. Another twist on grilled cheese is to put some butter and garlic salt on the bread along with your favorite cheese and than grill. We call it Garlic Bread Grilled Cheese. It is so yummy and goes great with tomato soup!